One of the main tasks of actionuni is the exchange with key stakeholders to influence the Education, Research and Innovation Policy of the coming years. Here we inform you in short about these networking activities. 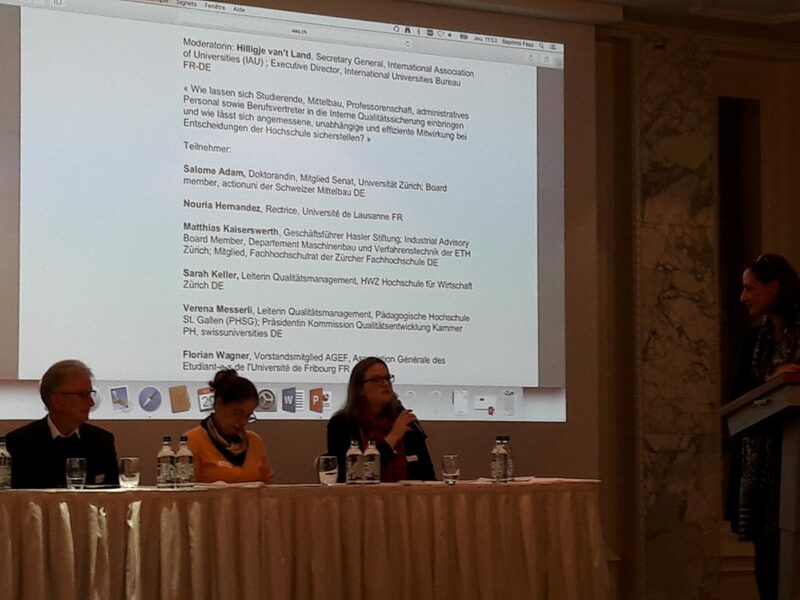 Last week, an interesting symposium on the topic of supervising doctoral students was held by ETH in Zurich. It was discussed, how better training for supervisors can improve quality of supervision, how a contract between the PhD-student and the supervisor can help clarify expectations, how PhD-committees help balance power, which platforms can help strengthen peer-feedback among supervisors and establish a commonly agreed on “code of conduct” for supervisors. We are looking forward to see the ETH and other universities develop this topic further. We are looking for two young researcher interested in traveling to Brussels from 1 to 4 April and represent actionuni at the Eurodoc Annual Conference and Annual General Meeting. Costs are covered. Please send an expression of interest to salome.adam@actionuni.ch by 22 February 2019. Last November, actionuni representatives had their annual exchange meeting with SNF representatives. At the meeting, questions from actionuni members to the SNF are discussed and actionuni gives input to current development of the SNF. Mobility as a selection criterion is obsolete: The SNF agrees that geographical mobility of young researchers as a criterion to judge a researchers’ professional network has become outdated, considering the way researchers are connecting nowadays through digital ways and means. The SNF this year aims to revise the requirements of its funding instruments accordingly. Stronger promotion of Post-Docs: Influencing employment conditions of post-doctoral researchers towards more unlimited contracts or Tenure Track is not possible through SNF as these are within the universities’ own competencies. Centralized evaluation strategy of SNF funding applications, starting 2021: By using centralized remote or panel-evaluation, the SNF aims to standardize the assessment and selection of candidates. Consequently, local selection committees (Forschungskommissionen) will be abrogated. On 29 November 2018, the second AAQ Institutional Accreditation Day took place in Berne. The topic was “Quality concerns everyone! How participation is lived at Swiss higher education institutions”. The program and presentations can be found online (DE / FR). How do you feel about your current job? What are your working conditions, your rights, your perspectives? Do you feel satisfied by your work-life balance? With the goal to understand these and other issues, Eurodoc launches today a survey on postdocs working in Europe. The survey will investigate the challenges postdocs are confronted with in the current job market in Europe, working and living conditions, their expectations and perspectives on their careers. Results will shed light on similarities and differences in how postdocs in different countries currently live and work from their perspective, with a specific focus on mobility, awareness of duties and rights, quality of life and well-being. Whether you are a postdoc working in academia, in public administration, in an NGO or in the private sector, take part in the survey! It will take less than 10 minutes of your time, but your participation is really valuable and your answers will help improve Eurodoc policies on junior researchers.